New Republic: Two Very Different Kinds Of Mormons This Republican primary season has seen two very different candidates (or potential candidates), Mitt Romney and Jon Huntsman of the Mormon faith. Matthew Bowman of The New Republic argues that Romney seems uncomfortable explaining his religion to the American people, while Huntsman is more natural. Former Utah Gov. Jon Huntsman and former Republican presidential hopeful and former Massachusetts Gov. Mitt Romney speak to the media in Salt Lake City, Utah. Both men are part of the Mormon faith. Matthew Bowman is a Ph.D candidate in American religious history at Georgetown University and associate editor of Dialogue: A Journal of Mormon Thought. He blogs about Mormon history at The Juvenile Instructor. Jon Huntsman, former governor of Utah, ambassador to China, and potential presidential contender, used to play the keyboard in a prog rock cover band called Wizard. In fact, he dropped out of high school, temporarily, in favor of music practices in a warehouse on the outskirts of Salt Lake City. The underground music scene of mid-'70s Salt Lake City was a bit tamer than most, but Huntsman faithfully toured the city's bars, fraternized with recreational marijuana users, and grew a shaggy mane — until his nineteenth birthday, when he got a haircut and left for Taiwan to serve a two-year mission for the Church of Jesus Christ of Latter-day Saints. For many presidential hopefuls, such teenage escapades might be little more than an embarrassing aside, but, in Huntsman's case, it's a striking example of his deft ability to negotiate between his Mormonism and the world around it. His coreligionist and fellow presidential contender Mitt Romney, on the other hand, has rarely displayed the same sense of ease. On the campaign trail in 2008, Romney appeared nervous and awkward when confronted with questions about his faith, often attempting to defuse the situation with a thudding joke about polygamy ("I believe marriage is between a man and a woman. And a woman. And a woman."). Although it was meant to seem self-deprecating, the gag only highlighted Romney's distinct awareness of his own otherness. 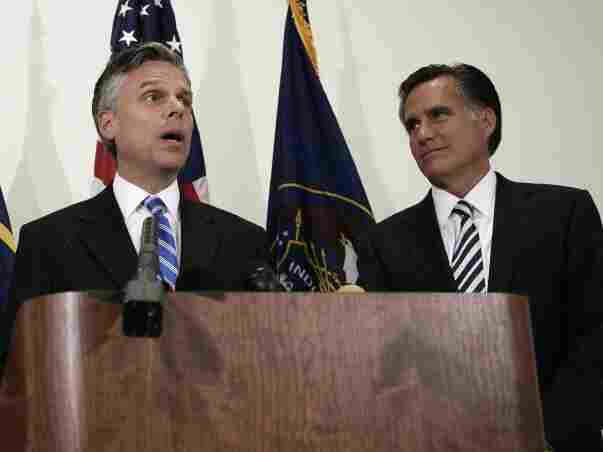 Huntsman is only 13 years younger than Mitt Romney, but they are generations apart in temperament. Romney trying on Huntsman's leather jackets and shades, or hopping on one of his motorcycles, would rightly make him look ridiculous. But, beyond mere differences of personality, Romney and Huntsman also represent two very different strains of Mormonism. While both men are the progeny of the same class of wealthy Mormon elite, Huntsman's public life is born of a younger strain of Mormonism than is Mitt Romney's — a Mormonism increasingly well-adapted to the boisterous diversity of early twenty-first century America, and, perhaps because of that, a Mormonism with which America is growing increasingly comfortable. Romney's 2008 presidential bid was dogged with the sort of accusations and rhetoric flung at Mormons since the time of Joseph Smith and Brigham Young: Mormonism, according to its detractors, was secretive, authoritarian, esoteric, hierarchical, and cultish. Damon Linker, in the pages of this magazine, worried that the grim specter of Mormon ecclesiastical authoritarianism would render the potential president a puppet of his faith rather than an agent of democracy. Opponent Mike Huckabee played the cult card, engaging in a bit of faux-regretful public contemplation of the weird things Mormons believe. And Florida televangelist Bill Keller, for his part, sent an email to 2.4 million fans declaring that a vote for Romney was a vote for Satan. For Romney, and many other Mormons, Keller and Huckabee's accusations were cruel distortions, and Linker's baffling, because they have never imagined their faith to be anything other than fully compatible with American democracy. In the mid-twentieth century, the men who led Mormonism were entirely, sincerely, and guilelessly committed to what they understood the American project to be. Their strain of Mormonism was shaped by a fierce Protestant work ethic that had made their Mormon grandparents successful settlers of the Salt Lake desert and by a reflexive suspicion of federal government hammered into their bones during the late nineteenth-century polygamy prosecutions. They believed in competence and self-reliance, in hard work and duty. All of this made mid-twentieth century Mormons incredibly successful practitioners of capitalism and helped ease their way toward assimilation with an America that valorized the boardroom and economic success. This strain of Mormonism — "business Mormonism" — was deeply patriotic for all the same reasons Calvin Coolidge and Dwight Eisenhower were. The church was meritocratic and technocratic, devoted to having meetings and wearing ties, to words like "responsibility" and "delegate," and to a firm optimism that dogged effort led to inevitable improvement. But, as American society endured the social conflagrations of the 1960s and '70s, business Mormonism's emphasis upon rectitude and moral behavior led it, increasingly, to emphasize its own moral distinctiveness and warn of the dangers of what it frequently called "the world." Brigham Young University mandated a business haircut for men in the 1960s, the same decade Mitt Romney was a student there, and the rhetoric of church leaders grew increasingly hostile toward popular culture. This Mormonism was awkward around, or even suspicious of, the cultural diversity and religious pluralism evident in late twentieth-century America — it was simultaneously committed to an ideal American way of life and wary of the fast decay of traditional American culture. Romney is very much a product of these values. Though he tried to downplay his Mormonism on the campaign trial, he was a man simply trying too hard: The faith's language and presumptions, style and values, imprinted his every move, and he was very, very aware of it. When reporters asked about his beliefs, he visibly tensed. Brought up among Mormons dedicated to self-discipline and hard work, and with a long memory of the hostility American culture once inflicted upon them, Romney expected to be assailed for his Mormonism and reacted accordingly. In addition to polygamy jokes, he veered between aggressive declarations of pride in his faith and attempts to downplay its theological differences with other American Christianities. Romney felt his Mormonism needed acknowledgment, explanation, and perhaps even justification; he believed firmly that it was consistent with American values but, at the same time, that Americans needed to be convinced of this. As a result, Romney's 2008 campaign attempted to defuse doubts about Mormonism by pointing at the way he had lived his life: his well-scrubbed wholesome family, his success at business, and his public service. This was not an attempt to dodge issues of theology — rather, it simply reflected what Mitt Romney genuinely believes religion is. In his 2007 speech on Mormonism and faith in America in College Station, Texas, Romney dealt with American religious pluralism by boiling all faiths down to what he called a "common creed of moral convictions" — a common ground of behavioral norms "on which Americans of different faiths meet and stand as a nation, united." But, to many evangelicals, who distrust Mormonism precisely because of its doctrinal distinctiveness, his words rang hollow — or even deceptive — and played into fears of Mormon secrecy and elusiveness. In the past two decades, however, the Mormon Church has worked tirelessly to counter these fears and images. In 1995, Gordon B. Hinckley, a charismatic public relations professional, became president of the church and sought to remake the way his faith related to the world. Hinckley's familiarity with media — and his ease in maneuvering around figures like Mike Wallace and Bill Clinton — signaled a subtle shift in Mormon rhetoric. Hinckley, who died in 2008, continued to emphasize the importance of moral behavior, but he also expressed devout hope that this would not make Mormons stodgy and boring. He jettisoned pessimism about "the world" in favor of apparent delight at taking questions from Larry King. He urged his flock to seek opportunities to be good neighbors and regularly offered praise for the wonderful things that he saw outside the boundaries of the church. He traveled to Asia and Europe, and, in Africa, he took photo opportunities with Desmond Tutu. He seized upon the 2002 Winter Olympics in Salt Lake City, simultaneously working to welcome the world while avoiding any hint of a "Mormon Olympics." The Mormonism of Gordon B. Hinckley was, in short, comfortable with going to the movies once in a while. This was the faith of Jon Huntsman's adulthood. Hinckley, in fact, called Huntsman's father to full-time service within the church in 1997, and Jon Sr. left his chemical business, Huntsman Corporation, in the hands of his children. The younger Jon worked there for many years, helping reinvent the company as a global corporation — one that's heavily involved in Asia and has taken great care to manage its media image in the United States. Huntsman's language skills were highly valuable during this process and also in his other jobs representing the United States overseas. His cosmopolitan and culturally savvy young adulthood reflected the changes happening within Mormonism itself. To read the rest of this article, visit The New Republic.